8/30/16 UPDATE: Bob Furmanek just announced the following update: The upcoming 3-D Blu-ray release of IT CAME FROM OUTER SPACE is Region-free and has the following extras: 3-D trailer, 2002 featurette on the history of the film, commentary track by historian Tom Weaver and closed-captioning! It is also available from Amazon Canada and Amazon UK. 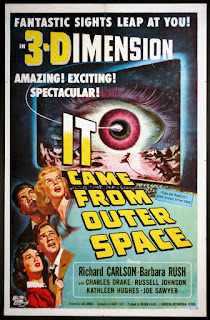 This post is just a little preview of the upcoming 3-D Blu-ray release of the 1953 favorite IT CAME FROM OUTER SPACE, coming on 10/4/2016 from Universal Home Video and available initially as a retail exclusive at Best Buy (link updated 9/15), with general availability at other retailers to be announced at a later date. I was recently granted the opportunity to see a preview of the final 3-D Blu-ray master that will be used for this release. Bob Furmanek, head of the 3-D Film Archive, invited me plus several others to view the master on his setup utilizing an Epson 5030 LCD projector running an image about 8 feet wide. The results, courtesy of Archive Technical Director Greg Kintz's 3-D alignment and panel matching, are nothing short of superb. I ran a 35mm dual-strip Polarized print at the Lafayette Theatre, plus I've seen it several times via this same process, and the 3-D Blu-ray is even better. Greg managed to correct 99.9 % of the errors in the original (there is one shot that Bob described as being impossible to fix - I think it lasts 4 seconds - and I didn't notice it while we watched the movie) and it just looks great. And there's a huge upgrade in the sound department - they were able to access the last surviving element of the original 3-track stereo master (Left-Center-Right) and have preserved the original - v e r y w i d e - dynamic range and channel placement. The previous DVD used a tamed-down version of this mix and hearing the Blu-ray is a revelation. I'll follow up this post with a full review when the Blu-ray hits the street, but this posting can serve as a preview and assurance that you can safely pre-order this science fiction classic with confidence. For more information about the film and its history, go to the 3-D Film Archive. Isn't that nice that Universal is offering this 3D classic less than other Blu-ray 3D.It's also shifty.Well this doesn't concern this title ,but Universal has no intentions of releasing the restored version of king of jazz,1930, on Blu- ray or DVD. They even deny that they own to0. What region will the Blu of ITCFS be? I don't think Universal has announced that information. A number of other releases from them are Region Free, but it might be best to wait for reviews if you don't have region free playback ability. Best Buy pre-order is sold out. Any idea when this will be available at other retailers? I seem to remember that it was about 6 months of exclusivity the last time BB had some Universal titles. Looking forward to this sci-fi classic. The worst shot in the movie is the helicopter sweep of the town right at the start, it's incredibly out of focus.How did the experts work around this? Other than correcting any 3-D errors in the shots you're talking about, what else could they do?